Let’s get this straight, intra day trading is a legitimate business practice. You, as an individual, can buy shares of any publically listed company and since the stock prices fluctuate hourly, you can actually make money within an hour if the stock you buy asccends in marke value. However, there are scammers who promise to sell you software which automates this process of buying and selling. They claim that the software buys stocks on your behalf, when the stock prices are low and sells off automatically when the prices rise, but in reality, the software may not even work and you may end up shelling out big bucks for the software. For the scammer, they make money not just by selling the software to you but they also make a brokerage commission from any stocks you may buy through their system. If you want to make money online through stock trading, there is no shortcut to doing so manually. If there existed a software which could automate it for you, then stock brokers would have already been rendered jobless. These are programs which ask you to deposit a large amount of cash upfront in exchange for high yields as time progresses. They do work upto a point but just as you are about the break even, the webste magically encounters ‘technical difficulties’ and goes offline, taking your investment with you. We all know what that means. If you have been contacted by any agency promising high yield returns, do make sure you ask them if their company is listed on the public stock exchange. A real business will have no problem sharing that information with you. A scam website, on the other hand, does not have any credibility or public references and is likely to bail out when posed with difficult questions. This type of scam is so prevalent and famous, it is unlikely that there is anyone who hasn’t heard about it already. 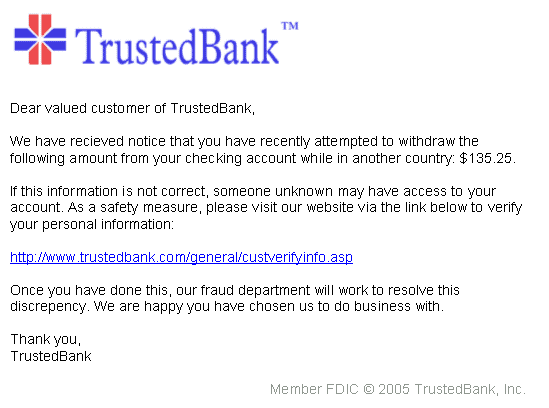 Unfortunately, apart from being the most notorious scam, this is also one of the most successful scams, because it preys on the base instinct of one human being to trust a fellow human, not to mention, the high rate at which the emails are sent also leads to a higher statistical success rate (for the scammer, of course, not for the victim). The format of the scam is simple, they will usually promise you a large sum of money in exchange for a typically miniscule help which they need on your behalf to get it removed. This is older than the internet. People telling that they have won the lottery and need to claim it immediately by filling in their dersonal details. It is one of the relatively harmless scams because the end goal is not to steal money from you but to get you to part with personal information. In the end, you will probally be added to multiple ‘make money online’ email lists and start receiving many emails daily. It’s a waste of time and usually stops at being an annoyance. These are landing pages created to mimic the more authorative banking websites to steal your sensitive information. The website is made to look and function like your normal banking website would, but the sensitive login details you enter are being logged and sent to the scammer, who will then withdraw or transfer money from your Paypal account or bank account. A good way to keep safe is to install good anti-virus software and always check the URL of the website you are browsing before entering any personal details into any online form. There are a lot of survey sites but there are some which offer disproportionately high rewards compared to the time being spent on taking the survey. A normal survey is supposed to pay a few cents to a few dollars at the most. Anything which promises a few hundred or a few thousand dollars, is more than likely to be a scam which will require you to pay them a big sum of money upfront as signup fees. Although there are many freelance sites which offer money in exchange for article writing services, there are many pyramid schemes which require that you pay an upfront fee, and refer other friends in order to be a part of their scheme. This is a composite scam involving a ponzi scheme coupled with a classic ‘get rich quick’ scam. Social media has become a part and parcel of daily life and no one can escape the reality that it has assumed the role of more than a mere tool of communication. It has become a business tool and no business today can do without some form of social media presence. With social media comes its own set of perils. Social media scams typically work to steal your personal data to be used later to either guess your Paypal/Bank password/ security question or, in more sinister cases, to use sensitive personal information to blackmail you. One of the most lethal examples of such a webste is the Ashley Madison case. These scams will ask you to send them money to have your resume sent to premium job listings with the promise of a great job, but in reality, they are stealing your personal information. A person’s work history is one of the most personal piece of information and how someone may misuse it is anyone’s guess. Your contact details may be sold to creditors and online salesmen because your credit rating can easily be discerned from your CV. Welcome Everyone and Thank You for Visiting! Here I am going to show trustworthy online opportunities, highlight scams that we all need to avoid and also how to build, host and activate your very own website … for online success a website is essential and can now be ready in a few minutes. Attachments sent through emails that have very harmful viruses that can compromise and infect our files, computers and also some that lock down our computers and then a ransom is requested to release/return our computer back to us again. We have to watch our Facebook messages, Messenger and so on to, for attachments that can download annoying, seriously dangerous or downright malicious malware to our computers, phone and other devices. I am sure everyone has also seen the posts in Facebook that depict something shocking and wanting us to click on it? Most of the time these are fairly harmless but very annoying … quite often they fill our page and our friends pages with their propaganda and sometimes can even seem to be posting on our pages without our knowledge offensive and cruel comments about others. Awareness is forewarned and forearmed in most of these cases, report the posts, let the person whose Facebook page seems to be hacked know … if possible outside the Facebook world by Face to Face or a telephone call. Next thing is there is a big auto monthly payment to them coming out of our account! The fine print telling us about this is either so small you can’t see it or is hidden completely! These, as many have found out to their cost are very difficult to stop, because you cannot contact them to cancel. They usually have an opt in contract that you have to cancel within 30 days which most do not know about and therefore are in the contract. It can run into thousands of dollars/pounds/euros, for very little value. Some have found the only way out of this is by cancelling their Credit Card/Bank Debit or Current Account and starting anew. Banks are even now saying, that even if the account is cancelled the customer may still be liable for the payment because they have not followed the cancellation policy and are still in contract! A really big mess and better to not get involved in these products at all or read everything very thoroughly before committing. To make money online we need a website and this is a no brainer. It has become easier and easier to set one up ourselves or employ/outsource this job to competent web designers or software developers to this professionally for us. We are available and can give competitive and economical quotations, please ask and we will get back to you as soon as possible. If you have any questions please comment below and I will get back to you as soon as possible.